Hello my friends, won't you please join me for a cup of tea? Don't be shy, please come in and have some tea with me. I'm linking with Sandi from Rose Chintz Cottage for Tea Time Tuesday, Susan from Between Naps on the Porch for Tablescape Thursday, Marty from A Stroll Thru Life, and Katherine from Lady Katherine Tea Parlor. 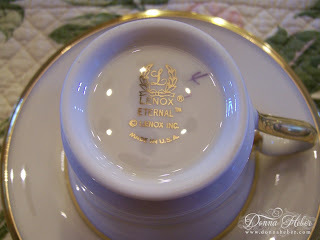 I have brewed some Darjeeling tea for us and today's teacups are from Lenox. This pattern is called "Eternal". This classy pattern is made from ivory porcelain, and is trimmed with a wide band of striking gold. Each plate is also accented with a thinner gold verge line. The simple gold bands that encircle Lenox Eternal pieces are symbolic of the wedding band. I love the elegance of this pattern - it is timeless! I am sure you will see this set again. 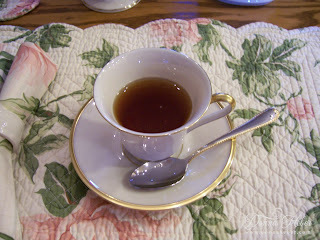 I have paired these teacups with some beautiful rose linens. The flatware is Gorham in the Golden Ribbon Edge pattern and compliments the gold-accented dinnerware. Perhaps you would like a fresh pizzelle with your cup of tea. 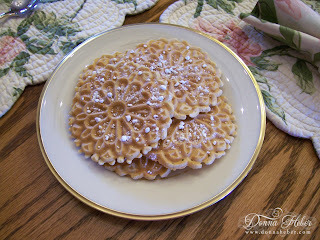 These Italian waffle cookies are delicious sprinkled with confectionery sugar. The ivory candle holder is also from Lenox and is decorated with an intricately pierced design. 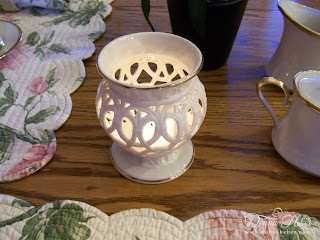 I love the way this votive glows and the accents of pure 24 karat gold gleam when the candle is lit. Thank you for joining me today and to our hostesses Sandi, Susan, Marty and Katherine. Can't beat a good cup of tea! thank you for stopping by and leaving that nice comment. So I discovered your blog and I must say, you are the second women named Donna,which I have many things in common. Your table ist just wonderful and your cat is so adorable. All is really nice. Your tea table is very inviting....beautiful china and placemats that I just love. I have 'Butterfly Meadow' from Lenox china and always get compliments on how pretty it is. 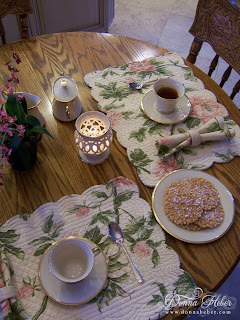 Next to biscotti, I think crisp pizzelles are a favourite to have with tea. What a beautiful tea time you are having. I just adore the linens you have also chosen. I am so happy to have you join me for tea today! 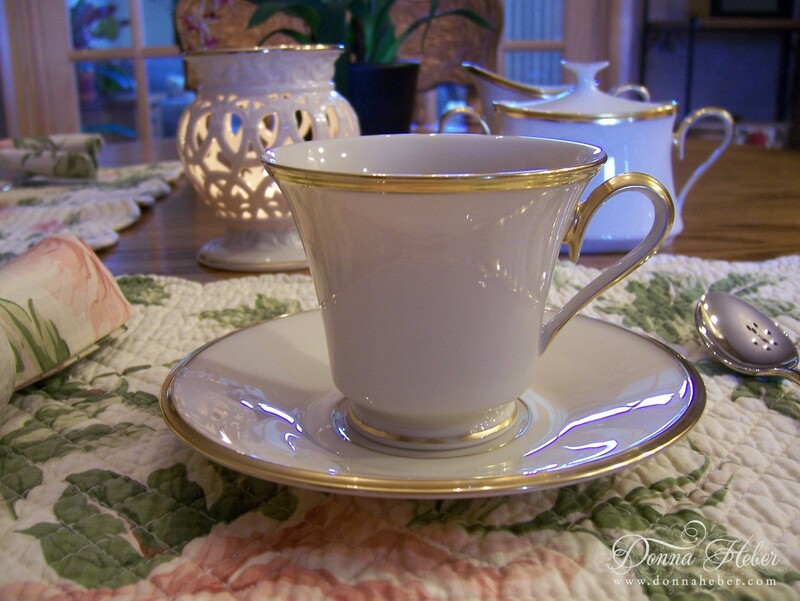 Your teacups are stunning and the placemats are so pretty! Your pizzelles look delicious. A lovely tea you have shared with us; thank you. Wishing you a lovely week and a very Happy Easter. I'm a new follower. Elegant tea cups, and the pizzelle look great! What a nice tea. Your tea setting is lovely. I have a pizzelle iron that I've never used. You've inspired me to take it out and put it to use. I love your beautiful tea. The rose linens are gorgeous. Everything looks so delicious and inviting. 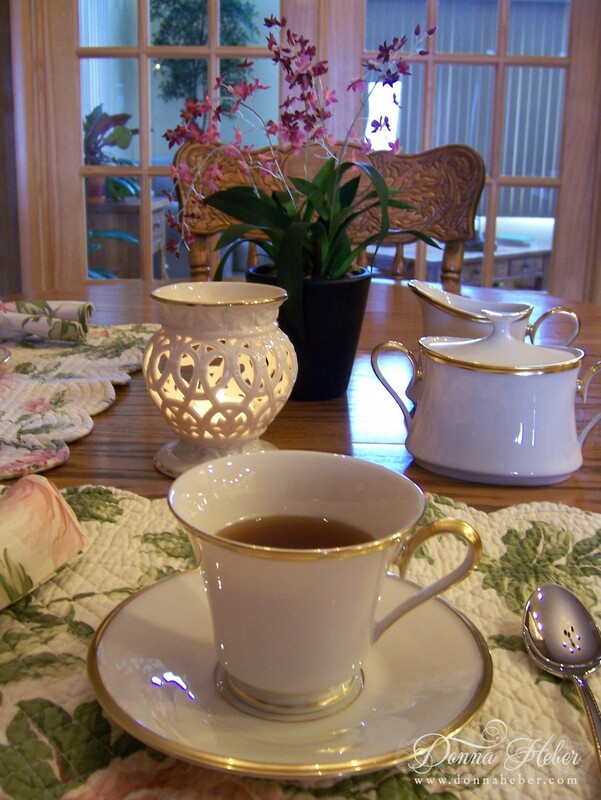 Your tea table is set beautifully! And you are right, that is a timeless setting! Everything is so pretty! your table setting looks great donna, beautiful dinerware. love a cup of tea with that delicious waffle. Gorgeous setting. The pizzelles look amazing! I used to work with a guy whose wife made them and he would bring them to work. I miss that. The Lenox looks lovely on the wonderful, springy placemats. Beautiful tea party! Donna, thanks for this beautiful and relaxing post today. I loved hearing the music and seeing the beautiful china patterns! Such a pretty setting, Donna! I love your placemats! Thanks for visiting my blog, too! Beautiful table setting. Tea sounds good right now. The day has been rainy and gray, so your post has put a smile on my face. Have a great day ahead..
Oh Donna, what a beautiful tea time setting! I love the placemats. Those yummy pizzelles make me drool! Just great! Have a nice and happy Easter. Hi lovely lady. I love your Tea time setting also so sweet. You have a Beauutiful Blog !!! Im your newest follower on your Blog. Thanks so much for your lovely comments on my Easter Tablescape. I would like you and your family have a Happy Easter. I hope you come back and see me next week for one more Tablescape. Your lenox china is beautiful-it truly is a timeless pattern. It looks lovely with the rose linens. Love your music also. I would love to have tea with you. I have never had pizzells they look yummy. Have a happy holiday. One Year Blog Anniversary Winner!